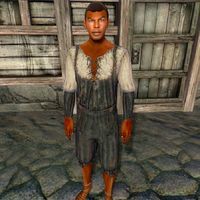 Jair is a Redguard rogue and a member of the Thieves Guild living in the Imperial City's Waterfront District. He shares his shack with another Redguard, namely Isleif the Open-Handed. Being a Rogue, he can cast leveled major Illusion spells. He ranks as a Footpad in the guild but rarely practices thievery, mainly because he is cautious and picks his victims carefully. Instead, he leads a simple and relaxed life and visits various destinations in the city. His shack is located in the center of the housing area and he sleeps there every night between 10pm and 6am. He will always spend the first two hours of the day (until 8am) wandering around in his shack and will always return home at 8pm for a chat with Isleif before bedtime. At all other times, on all regular weekdays (Morndas to Fredas), he will be away from the shack, venturing out into the big city. On Morndas, Middas and Fredas he will spend his morning in the Waterfront District, preferably in the area between the lighthouse and the Marie Elena. He pauses at 12pm for a two-hour meal at The Bloated Float Inn. After lunch he will, on Morndas and Fredas, resume his strolling in the District until 8pm. On Middas, he will cross the walkway and enter the Temple District and pray in the Temple of the One until 6pm. He will then return to the Waterfront for a bit of wandering before returning to his shack. On Tirdas and Turdas he will, at 8am, travel to the Market District and spend his morning there. At 12pm, he travels back to his shack for a two-hour lunch. The rest of the day is spent visiting his favored areas on the Waterfront. During the weekends, he stays inside the shack all day long, eating lunch at midday as usual, and only ventures outside at 4pm on Sundas for a four-hour prayer in the Temple of the One. The exception to this routine are during the Misdirection quest, when all Waterfront District residents are confined to their homes. Also, after The Ultimate Heist is completed, Jair will join his fellow guild-members in Dareloth's House every night between 9pm and 5am. Despite him living with the generous Isleif, he is quite poor and his wardrobe reflects that. It consists of typical lower-class items, a pair of fishing waders with braided leather sandals. He wields an iron dagger and carries a spare pair of belted braies and a small amount of gold. When you approach him, it becomes apparent that he is an atypical Thieves Guild member and prefers peace over confrontation: "I'm Jair, I'm a dip...a pickpocket. But relax. You're safe from me. You look like you might take offense. Too risky." When asked about the Imperial City, he will even provide a bit of fair warning: "You have to watch out for pickpockets in the city. You’d be surprised how many waterfronters earn a good income that way." Esta página foi modificada pela última vez à(s) 02h14min de 1 de junho de 2015.